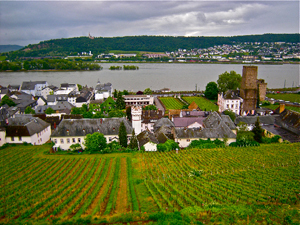 Rudesheim on the Rhein (Rhine) River is a beautiful and rewarding wine travel destination with lots to see and do that has something for everyone. The whole town is one big area dedicated to the glories of Riesling, with great reason, as it sits right below some of the best Riesling vineyards on earth. Even by chance you weren’t a big fan of wine, I still recommend a visit, because this very affordable place has plenty other charms on offer, including river cruises, great beer, sublime natural activities that feature forest walks, river promenade strolling with the local fowl, tough hikes, biking treks and romantic sightseeing. I must say the place was easy to walk and get around, plus I took a train from the Frankfurt International Airport to Rudesheim, so I never had to grab a cab or rent a car or even a bike the whole time I stayed. I did take the cable car and a chair lift, and if you saw the hill, you would too! I did put in two wonderful hikes during my visit to Rudesheim and toured the town by foot, giving me a chance to work up my appetite which turned into a blessing as the food was very enjoyable indeed, especially the fresh white asparagus that was huge and fantastic with hollandaise sauce. The German’s go crazy for the “Spargel” and I was lucky to have timed my trip well, as they only get 8 to 9 weeks of this magic! Rudesheim is to Riesling as Napa is to Cabernet, so when in Rome as they say, and I went Riesling nuts, but as always I still looked for Pinot Noir and other interesting things. I met some locals that pointed out small wineries and gave nice tips on food and local interest sites as well. I ran into a few winemakers and long solo vineyard walks, but there are “Wine Gardens” almost on every corner here so I got to try lots a great wine in fun social settings and just relaxed and took in the local color. Rudesheim even had Wine Kiosks! What a great idea, it was great to walk by the river, step into the park and find a local vintner pour his wines at a tiny wooden kiosk surrounded by trees and grass, brilliant, though I enjoyed the kiosk near the market square best and it was the place where I had the best wines. I learned to my surprise that the locals drink mostly dry Riesling, and I mean dry, even drier than Alsace, and though I had tasted a few super dry Rieslings from Germany, I was pleased more with the ones I tried here. In fact, I only drunk dry wines here, well I did have few Spatleses, but no Auslese or sweeter. Looking back it seems weird, though it felt perfectly natural, as that is what went with the food and mood of the place. At Rudesheim’s center square, I found a tiny kiosk that served local wines, and met a local winemaker pouring his wines. 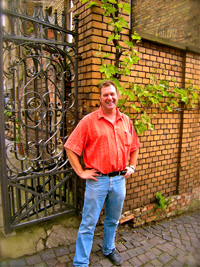 Hans-Peter Veith-Bertam a researcher at the famed Geisenheim makes a small amount of beautiful Riesling from family vineyards that have been in the family since the 1800’s at least, and may even go back to the late 1600’s! Now he leases most of the vineyard sites to other wineries, a move that lets him make high quality wine and keep his well-regarded day job. He showed me 3 stunning Rieslings, mostly in the drier “local” style, which is in fashion here, plus a 1999 Spatlese that was still perfectly fresh and rich in fruit. Best of all, unlike what we find at home in the USA, they all were fewer than 11 Euros, or $16-17 dollars! It was great to find Hans-Peter, as the grapes come from the vineyards I spent my time hiking to above Rudesheim, letting me really taste the place under foot. More from the Rheingau, Germany coming soon. 2008 Veith-Bertram “Via Castellum” Riesling “Rudesheimer Bergweg” Trocken (Dry) Rheingau, German White. This wonderful and fresh young Riesling has plenty of everything to appeal to everyone, but is bone dry and brightly flavored. This wine shows off pretty lime and citrus flower, with tangy white peach, melon, tropical fruit and loads of mineral and flinty slate. Should gain a bit of weight in the future, but is clean, refreshing and zesty now. 2008 Veith-Bertram “Rosarius Versura” Riesling “Rudesheimer Berg Roseneck” Kabinett Feinlieb, Rheingau, German White. 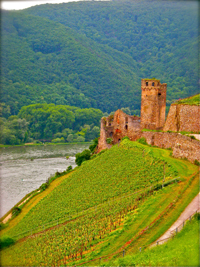 Roseneck is one of the finest Reisling vineyard sites in German, and is in a stunningly beautiful location overlooking the bend of the Rhein River with castles and eagles all in view as well, this site is steep and gives tiny yields of great fruit. This wine, while only a Kabinett is intense and has vigor, with vibrant deep fruit that explodes on the palate. This vintage looks to be a classic around here and shows loads of stone fruit, peach, apricot and white plum, along with pineapple, guava and pure apple in the background, with some tangerine and citrus flowers. This wine will gain muscle and flesh with time, though it is lovely and balanced now. This wine has good fruit, plenty even, but still remains dry and tangy. 1999 Vieth-Bertram Riesling Spatlese “Rudesheimer Berg Roseneck” Rheingau, German White. Even with 10 years of age, this gem is fresh and zesty with full body and a slight honey tone to the lush apricot and applely fruit. The mature side takes a bit to come through, but finally does with a classic petrol fume and thick liquid mineral feel on the nose and palate that adds to the whole, showing the complexities of aged Riesling. Even though a Spatlese, the sweetness feels perfectly balanced and makes this wine great for anytime drinking, though it would be killer with crab.